August 2nd 1919 marked the beginning of a new type of statistic; commercial airline disasters caused by a mechanical of structural flaw. 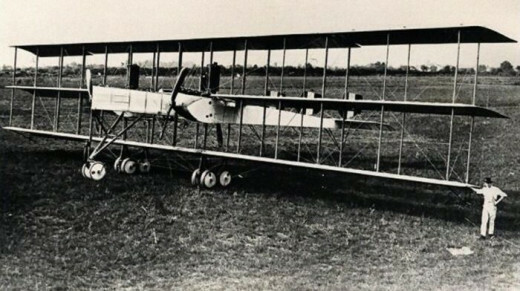 Only five years after Tony Jannus and his one official passenger flew a short twenty-three minute route in Florida marking the inauguration of commercial flight, tragedy struck. Sometime after 5 pm on August 2nd, 1919, while making a return flight to Milano-Taliedo Airport in Italy from Venice-Marco Polo Airport, Italy, a Caproni Ca.48 carrying 12 passengers and 2 crew suddenly began to fall to the Earth from 3,000 after just passing by Verona Airfield in Verona also located in Italy. It is reported that several passengers attempted to jump from the aircraft before it collided with the ground though in the end all 14 passenger and crew perished. 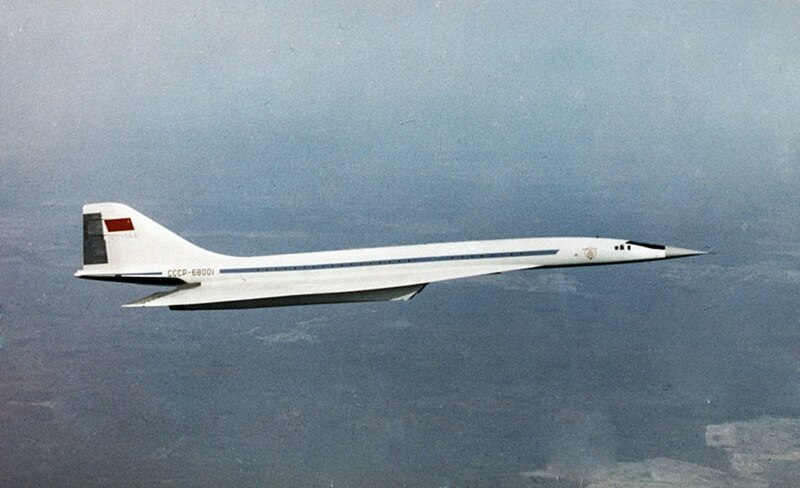 After investigating the events leading to the disaster it was discovered through witness testimony that the wings had appeared to be wobbling as it passed by Verona, soon after the wings buckled completely, dooming the aircraft to live in the history books as aviation's first commercial disaster. Scene from flight 981's debris field. 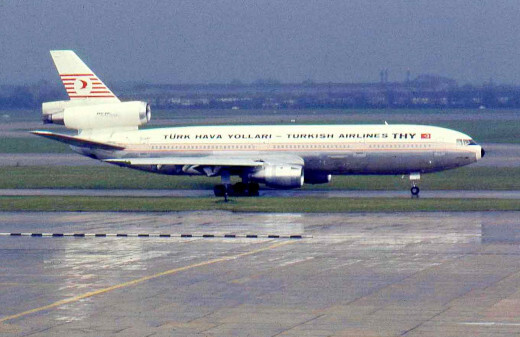 On 3 March 1974, a McDonnell Douglas DC-10 operated by Turkish Airlines departed from Paris, France en rout to London, England. After having a successful trip from Istanbul to Paris there was nothing to indicate the impending disaster. As a way to increase the area in the cargo hold located below the aircraft, McDonnell Douglas designed the cargo bay doors to open outward. When closed, large hooks would lock over a strait metal bar, to further secure the door the ground crewmen would push in a large lever that would drive through locking pins through the top end of the hooks after loading the bay. It was discovered afterward that it was possible for the lever, though in the locked down position, to never engage and secure both the hooks and locking pins. Without the doors being secured the door could give way to pressurization during flight, and on march 3rd that's exactly what happened. Around 8 minutes after takeoff, the door blew off the aircraft, ripping a huge whole inside the cabin that claimed two rows of seats and it's occupants and left a view of the skies over France for those still on-board to witness in horror. As well the primary and two sets of back-up hydraulic lines that controlled the horizontal and vertical stabilizer were sucked out of the plane leaving the crew helpless to control the crippled DC-10 as it bank left and pitched it's nose down. The speed of the DC-10 rose to 430 knots or 490 mph as it speed toward the grown nose first, though it did begin to level itself out as it near the ground, it was simply too late as the plane disintegrated on impact, leaving virtually no identifiable piece to even distinguish it as once being an airplane. Though this leg of the DC-10's route was usually scarcely booked, the passenger itinerary rose to 335 people due to a strike at the time by a more used British airline, as well on board was it's 11 crew; all 346 souls aboard flight 981 perished less than 10 minutes after takeoff. Final image of flight 191 as it banks left at 300ft. Again in 1979 another McDonnell Douglas DC-10 would make the news. 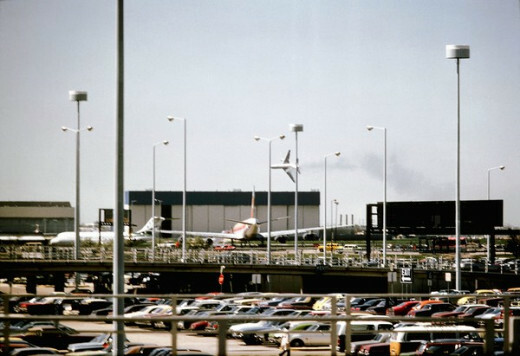 On May 25, 1979 American Airlines flight 191 boarded for a routine flight from Chicago's O'Hare International Airport to Los Angles's LAX, aboard sat 258 passengers and with them 13 crew members. As every flight before it, the DC-10 made a normal taxi to it's designated runway, it was given the all clear from Air Traffic Control and soon made it's way down the run way reaching closer and closer to it's take-off speed but just as it achieved this speed the left pylon assembly and engine (engine 1) it supported was ripped away from the aircraft , damaging 3-feet of the leading edge of the wing. Though most aircraft are fully capable of flying with a detached engine, the damage it had left behind, including severed hydraulic lines would doom the plane. The crew was able to control it's ascent up to 300 feet until suddenly it rolled left and banked toward the ground impacting towards the end of the runway, killing 2 on the ground and all on board. The final scene to this grisly day began well before the moments leading to impact. Faulty maintenance turned out to be the culprit. Engine one had been removed sometime prior, during reattachment the pylon sustained damage it's attachment fitting had struck the mounting bracket which told investigators that something other than the aircraft had been supporting the engine during reattachment, this thing turned out to be a forklift. For eight weeks the damaged pylon grew weaker and weaker due to the stress of every takeoff and landing until around 3:03pm May 25th, 1979. 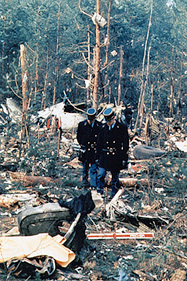 Image taken showing the loss of flight 123's vertical stabilizer. 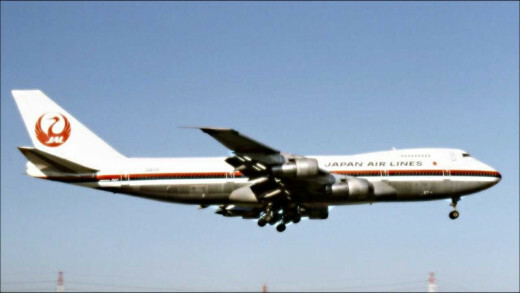 Considered to be the deadliest single-aircraft disaster in the history of aviation; the story of Japan Airlines flight 123 begins seven years prior to the fatal accident that rocked the aviation world. On June 2, 1978 the Boeing 747 while landing at Osaka, Japan struck the runway with the aft, or rear of the aircraft, severely damaging multiple elements including the frame, skin and bulkhead. The aft pressure bulkhead was later repaired against Boeing's prescribed method of mending the damage due to difficulties aligning the correct part being a single splice plate; it was decided to split the plate and install them individually in turn the duel row of rivets that the single plate called for turned into a single row; this row would be solely responsible for transferring a load that was designed for two rows , as a result weakening the structure that would, seven years later, down a titan of the skies. On June 2, 1978 the full repercussion of this flawed repair would come to fruition. As the aircraft began it's climb to cruising altitude, the pressure from the cabins pressurization system began to cause critical stress to the ill-repaired bulkhead. Cracks began to form and grow along the weakened rivets until around 12 minutes after takeoff, the bulkhead failed, releasing an explosion of air into the tail end of the 747, tearing off it's vertical stabilizer and severing the hydraulic system that control as well the horizontal stabilizer paralyzing the crews ability to pitch the nose up or down. After over 30 minutes of fighting the aircraft using engine thrust alone, the 747 plunged into Mount Takamagahara killing 509 of the 520 on board. Image of flight 243 after it landed safely in Maui. Though the exact cause of this incident may forever be shrouded in mystery, it's result led to Congress passing of the "Aviation Safety Research Act" and is considered one of the most important incident in aviation history in terms of changing policies. 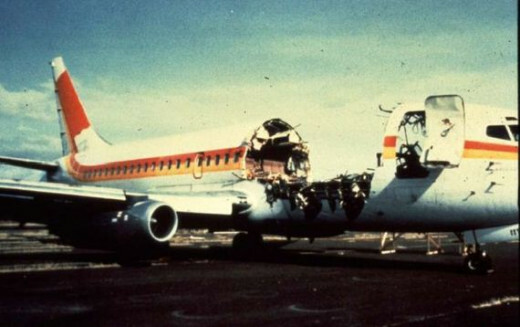 On 28th,1988, Aloha Airlines flight 243, en-route from Honolulu from Hilo, Hawaii would make aviation history. While cruising at 24,000 ft a large explosion rocked the aircraft and ripped a new sky view above the front end of the 737, exposing all of its passengers to the oxygen devoid air of it's extreme altitude. The pilot was able to safely land his 737 at Kahului Airport on Maui, but with the loss of one of his crew, veteran flight attendant Clarabelle "C.B." Lansing who had been sucked out of the aircraft at the moment the roof at torn away from the plane. She would be the only fatality of flight 243. It was later discovered that the tear strap system, which is designed to limit the damage of fatigued fuselage metal that may tear away during flight to a 10" square area. The National Transportation Safety Board or NTSB ruled that it had been poor maintenance and inspections that led to the oversight of this massive structural fatigue in-turn leading to newer and much more efficient policies that make the catching of such deficiencies much more likely before a tragedy results from the damage. Still there are other theories that swarm the flight, such as the "Liquid Hammer" theory which states there was a hole that wasn't able to decompress quick enough therefore causing an explosive decompression once the forces became to uneven and strong against the fuselage. We may never know the exact cause that landed Aloha Flight 243 in the history books. 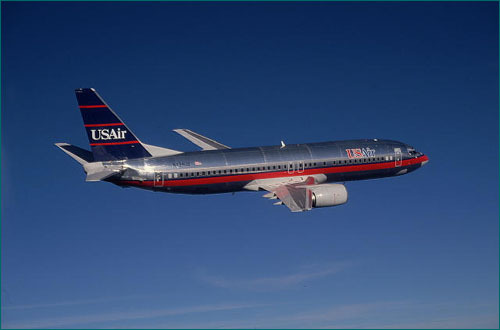 A USAir 737 similar to flight 585 and 427. Animation showing final roll of USAir flight 427. Two Airlines, same aircraft type, separated by 3 years experience the same fate only moments before they would be safely back on the ground at the conclusion of their flights. On both occasions the aircraft was descended from their respective cruising altitudes and approaching to land when suddenly a loss of control caused them to veer off their paths; with so little altitude below them the pilot and first officer had no true ability to troubleshoot and recover the aircraft before impacting the ground. United flight 585 experienced this fatal conundrum while approaching Colorado Springs Colorado on March 3, 1991; USAir flight 427 was approaching Pittsburgh, Pennsylvania on September 8, 1994. The investigation into the United accident came up empty, they could find nothing out of the ordinary that could cause such a fatal and dramatic end to the highly respected and operated 737 which made the uncertainty so much more troubling. How could the NTSB prevent this from happening again if they can't figure out what that something was. Fast forward 3 and a half years to September 8, 1994. A little after 7 pm USAir is approaching Pittsburgh, Pennsylvania, when suddenly loud thumps could be heard, the 737 began to bank then roll towards the left, it then inverted and stalled falling to the Earth at 300 mph. The similarity between this accident and United flight 585 was uncanny and prompted the United investigation to be reopened. 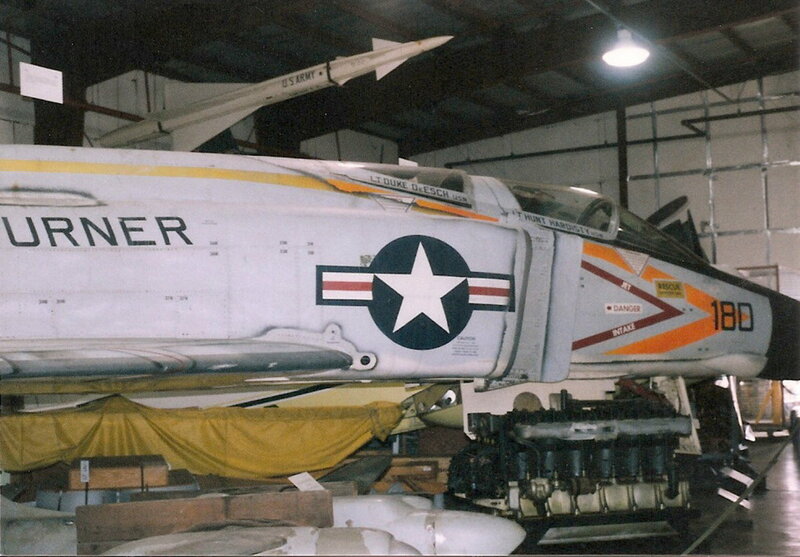 The discovery of the fatal flaw came at the request of an investigator to test the servo valve which controls the left and right movements of the vertical stabilizer; it was discovered that though only 1% did it occur in testing, in the right condition the servo valve could reverse making left right and right left when being controlled by the pilot. With this happening so late in the flight and so close to the ground the pilot would have very little time to figure out that his controls had been reverse or even froze. This lead to better training in such emergencies and the development of better safer systems to use aboard aircraft. 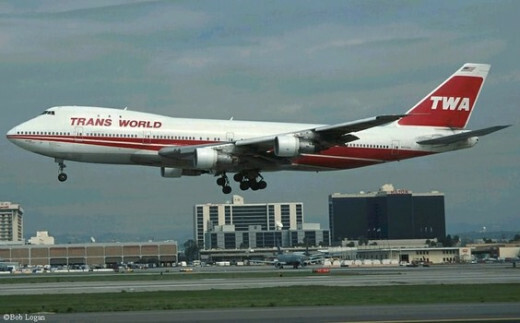 A TWA Boeing 747 similar to flight 800. Authorities attempt to piece flight 800 back together to attempt to reveal what lead to it's tragic fate. 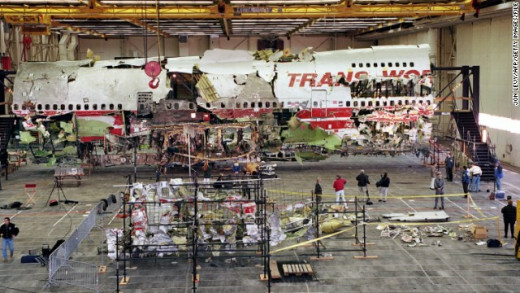 Though controversy still lingers about the fate of TWA flight 800 on July 17th, 1996 in which all 230 souls were lost shortly after departing John F. Kennedy International Airport in NYC,NY en-route to Rome with a stop to Paris in-between. The Boeing 747 suddenly erupted into flames and broke apart shortly after takeoff falling into Moriches Inlet,NY. The most logical reason seems to be a sudden explosion of it's center wing fuel tank (CWT) due to the flammable fuel/air vapor being ignited by some source most likely a short circuit someplace near the vapors. As well "The certification of the Boeing 747 with heat sources located beneath the CWT with no means to reduce the heat transferred into the CWT or to render the fuel tank vapor non-combustible." the NTSB stated could have contributed. Since better means have been met to lessen the threat of a vapor explosion in an aircraft fuel tanks. Final recorded conversation between flight 261 and ATC just before impact. While en-rout to Seattle, Washington from Puerto Vallarta, Mexico with one stop to San Francisco scheduled in-between, it's January 31, 2000; Alaska Airlines flight 261, a McDonnell Douglas MD-83, would experience one of the most dramatic accidents in aviation history. 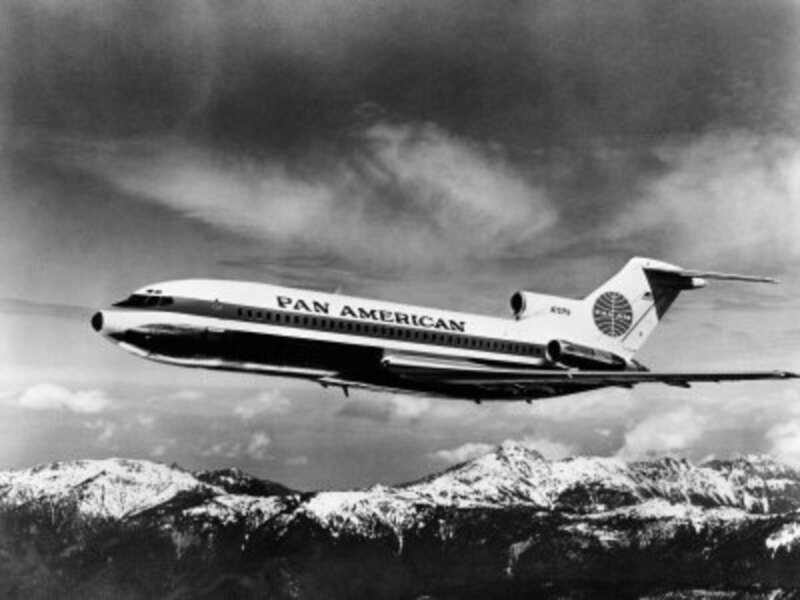 As the aircraft cruised at 31,000 ft towards San Francisco, California the horizontal stabilizer responsible for helping in keep the angle of the aircraft is frozen; the pilot and first officer attempted to run troubleshooting measures but to no avail. They further attempted troubleshooting with the Alaska Airlines Maintenance department as they were forced to fly the MD-83 manually but again no one could figure out the exact cause of the problem. Still attempt to free the horizontal stabilizer they switch on the electric motors that are responsible for controlling in, suddenly the MD-83 dives towards the ocean below forcing the pilots to try to pull it out of it dive manually, they had fallen 5,000 ft in just over a minute. After a few moments they are successful in recovering the aircraft. Realizing the dire situation they were in the pilots decided to ask ATC if they could divert to Los Angeles, after air traffic control approved the pilots requested to approach via the Pacific ocean so encase they loss the aircraft again there would be no risk of further life lost on the ground, this noble decision in fact saved lives that day for as they began to approach LAX from the sea the plane's jack screw that controls it's horizontal stabilizer broke free of it's retaining nut forcing the plane into it's final dive, within 60 seconds the aircraft was lost, hitting the Pacific at over 240 mph; all souls on board perished. 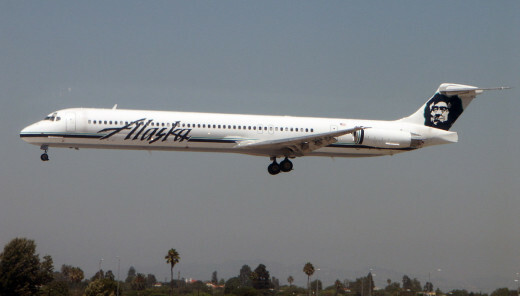 This very preventable accident, as later discovered by investigators was due to a multitude of failures on the maintenance end of Alaska Airlines, issues so flagrant that one of their own, John Liotine, attempted to alert officials fearing for the lives of Alaska's passengers, instead he was labeled a whistle-blower and was suspended. An investigation was launched but it was too late for flight 261, investigators would realize too late the very facts that could have saved the airplane. It would turn out to be something as simple as not enough lubrication, or grease keeping the jack screw from going metal to metal in which metal fatigue would devastate the only system that control something as vital as the horizontal stabilizer and with no fail-safe built into the system by the manufacturer, the chance of fatality in almost certain as proved that January evening. In short the threads that control the screw were work away leaving only a retaining nut, that wasn't designed to handle such an aerodynamic load, to hold the horizontal stabilizer in it's correct position as the pilots attempted to bring the plane to LAX, as would be expected, the nut grew too weak and the screw simply broke away taking all control permanently away from the pilots, dooming all 88 on board. Though the loss of these aircraft and all those aboard are truly tragic, the legacy and lessons they left behind have forever reshaped the aviation industry and the safety measure that govern it. 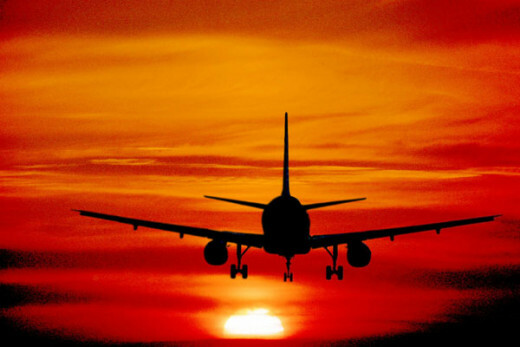 Their loss was not in vain, through their tragedy millions of travelers fly safer everyday because of the discovery of deficiencies in both policy and aircraft design through the investigations that ensued. May the victims of these and all commercial aviation disasters never be forgotten as they fly into the sunset of aviation history. 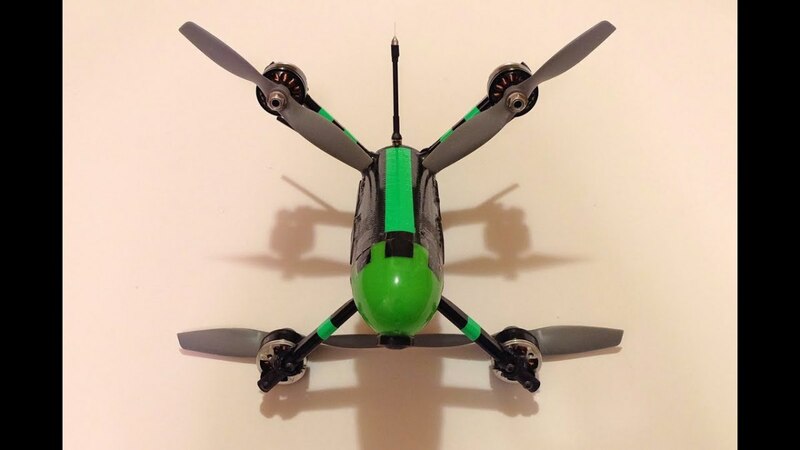 How nervous are you to fly?